Secrets they say' makes a man, "what you don't know is above you. Nwannekaenyi "Nnamdi" Kenny Okwu Kanu; (born September 1967) is a British-Nigerian political activist. He is a leading member of The biggest Biafran organisation, the Indigenous People of Biafra (IPOB), which advocates a sovereign state for the Igbo speaking people of Nigeria as well as those from the south-south region of Nigeria. 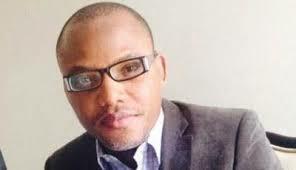 Kanu is the director of a London-based radio station named; Radio Biafra. Kanu was arrested on treason charges in Lagos on 14 October 2015 and was detained in a Nigerian jail without trial for more than a year-and-a-half, despite various court orders that ruled for his release. When in court, Kanu appeared regularly wearing a Jewish prayer shawl and head covering. He said in court that he "believes in Judaism" and considers himself a Jew. Before i proceed in advent of divulging the reason of behind his rise to fame let us explore the meaning of the word secret: "Secret is that which is hidden from the knowledge of others, either for selfish purposes or for greater good. Many have been searching to find out how come his sudden rise, look no further' Here there are. HUMILITY: There's this saying which says that pride goes before a fall and also the promise of chiukwu okike abiama to lift the humble and to demote the pride, Nnamdi kanu the lover of chiukwu abiama words sure does understand the virtues of humilty and had imbide this in his character as he always hold every one at higher esteem above himself. And this is the number one of his secrets. SINCERITY: This where he derive his act of whiter than white for Biafrans, this virtue is rare in our society as many who had been in his position had always failed the acid test of sincerity and i tell this too is a big secret of his success. ￼Nnamdi kanu in cross section photo. he had remained fearless amidst great threat and this is sure a great virtue and a secret. FAITHFULNESS: Faithfulness to the Almighty Creator and to fellow men is something desirous, a rare commodity, when all you see among many is betrayers and sabotuers but MNK had remained faithful to his beliefs and those who trusted him and this had endeared him to many. WISDOM: This secret is like a container that contains other secrets like; Purposefulness, Vision, Love. Wisdom is the rightful application of knowledge and the understanding of applicable principles, these are the reason why the oppressors are always behind in his scheme of actions. little wonder his detractors are either crying or wailing. Every success today is based on the applications of secrets and these secrets today is become the success story of MNK.